1) Your reward for eating so many freggies. 2) Your opportunity to enjoy a dessert that won’t give you sugar overload. See, we can have our cake and eat it too. We just need to use wisdom. Sweets are a treat, not a food group. I encourage you to read: Breaking Free of Sugar Addiction ~ Should We Be Eating Stevia? for more of my thoughts on this subject. Then, I would like you to file this newest recipe away for the next time you need to make an easy treat to share. It is very low in sugar, but you’ll still be enjoying a rich, delicious treat! Stir flour and sucanat together in a bowl. Add melted butter, combining well. Press mixture into a 9×13 inch baking pan. Bake in a 350° oven for 12-15 minutes or until golden brown. Cream together softened cream cheese, vanilla, and stevia. Set aside. Whip cream until soft peaks form. Fold in cream cheese mixture until smooth. (I actually throw all ingredients together in my BlendTec and let it do all the work of whipping and blending at the same time.) Spread mixture over cooled Shortbread Crust. Cover and chill for about two hours until set. Makes about 18 servings. So freggies first, low sugar cheesecake second. It’s a win-win. Which of the cheesecake recipes will be your favorite? The plain, the pumpkin, or the chocolate? I see this in my future! Thank you for giving us healthy treats as well as healthy meals! Looks yummy! I have a blendtec too. What setting do you use and for how long? Thanks! My daughter (11) made the pumpkin cheesecake at Thanksgiving time as I was too sick to make it. We don’t have a blender so she had to mix everything by hand–literally by hand in order to get the cream cheese to blend. Because I was sick I wasn’t sure that the cheesecake would get made but she was determined to do it. She was a good sport about having her hands so cold as the cream cheese hadn’t softened first like it should have under normal circumstances. She did a good job and we all enjoyed the fruit of her labor. My husband doesn’t care much for pumpkin, but he does love cheesecake. We’ll definitely be giving this version a try. And I can imagine me liking the chocolate one! Thanks so much for sharing this recipe, Laura! My hubby’s favorite dessert is cheesecake, but he is also trying to watch the waistline. This is going to be perfect for his birthday next month. 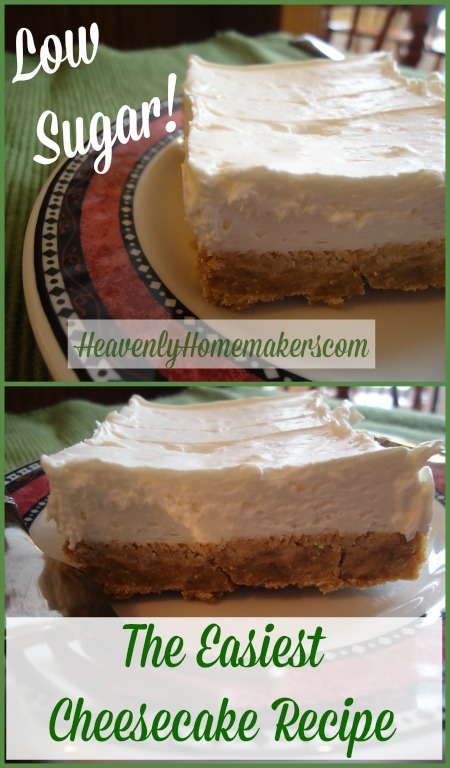 I love the shortbread crust! I usually make your graham cracker recipe and then blend them in the food processor, but this is SO much easier! We don’t care for stevia. What other sweetener would you recommend and how much–to still keep it in a “low sugar” category? Thanks so much!!! I will definitely try this. This LOOKS amazing and I want to eat it right off the page. But I do have a question/concern. We use stevia in combination with other sweeteners because we’ve found stevia can have an almost bitter, artificial flavor if used alone. This isn’t true of every recipe though. So is this a recipe it isn’t noticeable in or might some still prefer added honey or other sweetener with the stevia? Just curious because I’m thinking perhaps the shortbread crust may remedy that potential problem in this recipe. I’ve just received your book and am really enjoying how practical it is! I think the sweetness in the shortbread crust (using sucanat) helps make the stevia in the filling un-noticeable. :) NuNaturals brand of stevia (liquid) is my favorite as I find it to be the least bitter. I too have a problem with Stevia, what else can be used to lower the sugar content? or how much actual sugar would be needed? Please someone fill us in, who don’t use Stevia.. Thank you Laura, Stevia and I do not get along well. the Maple syrup sounds great.